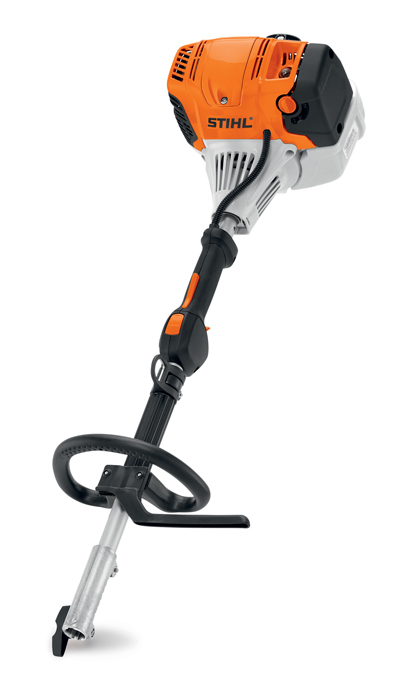 The KM 91 R KombiMotor gives professional landscapers great versatility and dependable performance during daily use. Instead of a pile of tools on the trailer, why not have one dependable engine with a selection of space-saving attachments? That's exactly what the KM 91 R KombiMotor delivers. It also offers simplified starting with its semi-automatic choke lever, as well as one-touch stop and 30% longer run time compared to previous models. Whether you're looking to supplement your current collection of power tools, or streamline your entire operation, this KombiMotor is a solid investment for any pro on the go. The STIHL KombiSystem is a versatile landscaping system that includes a powerful STIHL KombiMotor and a full line of attachments. Together, they give landscaping professionals the ability to tackle a tremendous range of outdoor tasks without loading the trailer with a pile of tools. Attachments include trimmers, blowers, hedge trimmers, edgers, pruners, cultivators and more. Each attachment slides into the KombiMotor effortlessly and is secured via a quick-release coupling system, saving you time as well as trailer space.